The diamond clarity chart can be found at the bottom of this page. 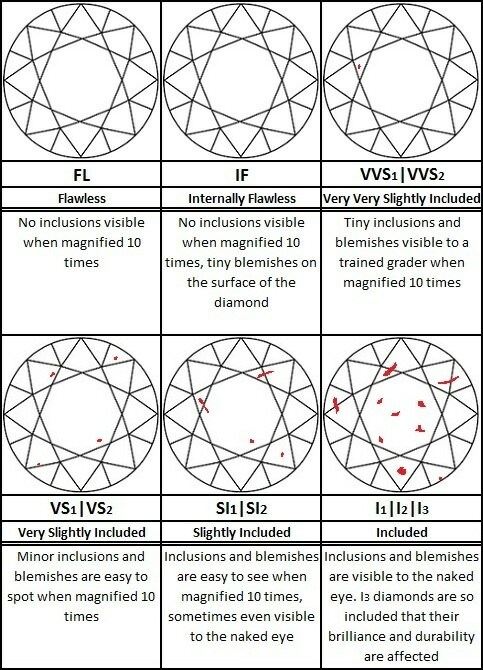 It gives a quick overview of how included diamonds can be at various clarity grades. Diamond clarity is based on how included the gemstone is. Inclusions in a diamond can be another mineral or small fractures inside the diamond. This will hinder the light passing through the diamond and lower its brilliance. Blemishes are small imperfections on the surface. They usually dull the sparkle of a diamond. No inclusions or blemishes are visible to a skilled grader using 10? magnification. No inclusions and only minor blemishes are visible to a skilled grader using 10? magnification. Inclusions are difficult for a skilled grader to see under 10? magnification. Inclusions are clearly visible under 10? magnification but are considered minor. Inclusions are noticeable to a skilled grader using 10? magnification. Inclusions are visible to the naked eye and may affect transparency and brilliance. 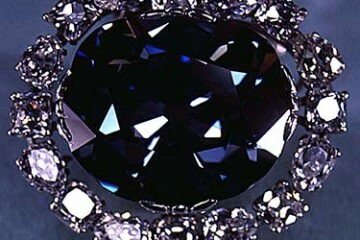 I3 diamonds are often so included that their brilliance and durability is reduced. Other grading systems do exist (many based on the GIA grading system). However most are being used less and less. Almost all diamonds on the market are graded with the GIA diamond clarity grading system. 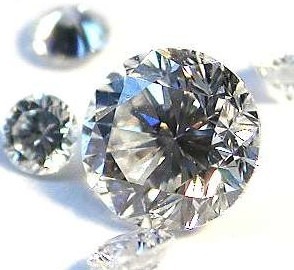 Virtually all diamonds sold on the market today have an SI to VVS grade clarity. Meaning that they will appear flawless unless you are a skilled gemologist using magnification. Though some SI1 and SI2 diamonds may have inclusions that are visible to the naked eye. Clarity can have a large effect on the price of a diamond. 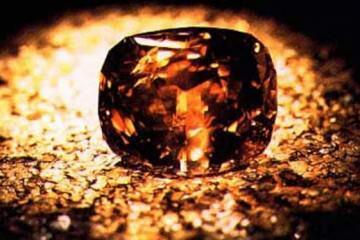 For example a VVS1 diamond can be as much as two times more expensive than a SI2 diamond. Even though both are called ‘eye clean’. The reason being that even though the inclusions and blemishes are not visible to the naked eye they still have a negative effect on the brilliance of the diamond. This is one way you can save a lot of money when buying a diamond engagement ring. What Clarity Grade Should I Buy? If you are looking to buy a diamond you are probably wondering what clarity grade you should be buying. This of course largely depends on your budget. However you should know that the difference between a flawless diamond and an SI2 diamond is quite small. Both grades are eye clean and the brilliance of an SI2 diamond is hardly affected by the inclusions in the diamond. Though exceptions to this rule do exist. For the best mix between price and quality you should buy either a VS or VVS clarity diamond. While if you are on a smaller budget, or simply don’t want to spend a fortune, you should have a look at an SI1 or SI2 clarity diamond. 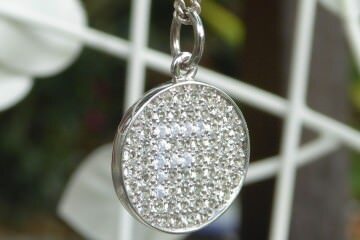 Be sure to look around though, diamonds are a natural product and not every SI diamond is the same. It is possible to have an SI diamond with an inclusion that is visible to the naked eye. Especially when dealing with SI2 diamonds. I would advise against buying an I grade diamond. Many people won’t notice the flaws at first sight, but if they take a closer look flaws are often very noticeable. If you insist on buying an I grade diamond at least stay away from the I3 grade. Not only will almost everyone see the flaws, they are also so included they become more fragile. Most dealers won’t sell any diamonds below I1 grade and for good reason. If you are on a budget and are looking for an I clarity diamond for that reason I’d buy a slightly smaller diamond with SI2 or better clarity. Clarity can be enhanced through several methods. One method is to fill fractures with another substance to enhance the clarity. Another method is drilling a hole with a laser to an inclusion. After that acid is used to either remove the inclusion or to change its color so it is less noticeable. Legitimate companies will always disclose clarity enhancements. This disclosure is important because prices for clarity enhanced diamonds are far lower than those of completely natural diamonds. If you don’t mind buying an enhanced diamond be sure to mention that when you bring your diamond ring in for repair. Because most clarity enhancement can be damaged by the heat of a jewelers torch. 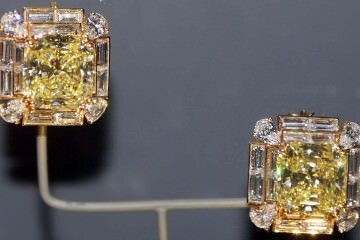 For more information on diamonds take a look at these articles: Diamond Overview.